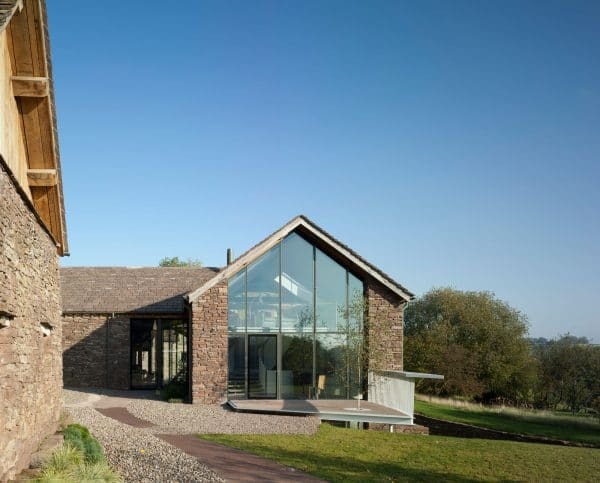 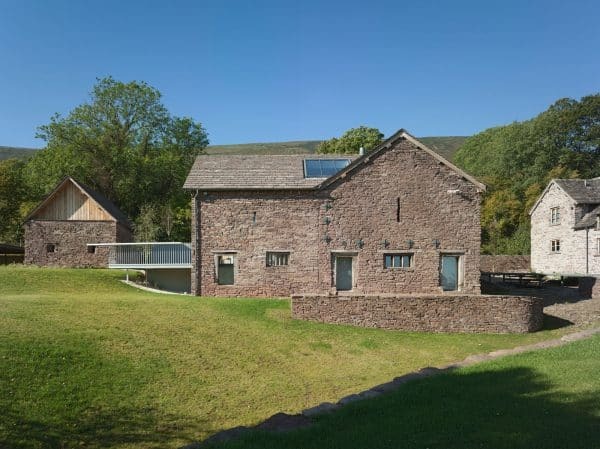 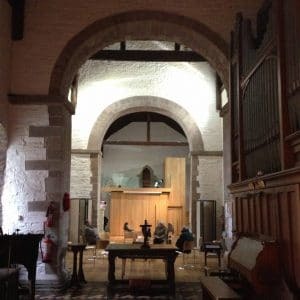 A barn dating from the 17th century with inspiring views over the Herefordshire countryside was suffering from a lack of recent maintenance that meant it was in a very poor – and potentially dangerous – state of repair. 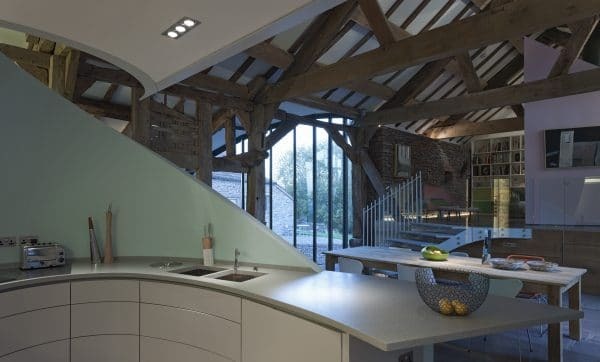 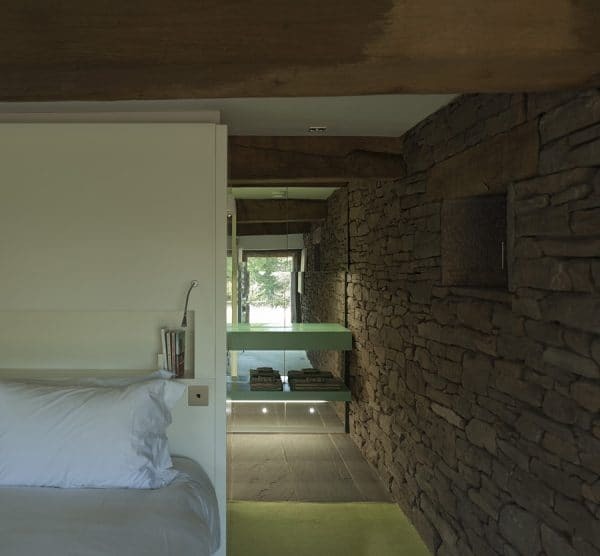 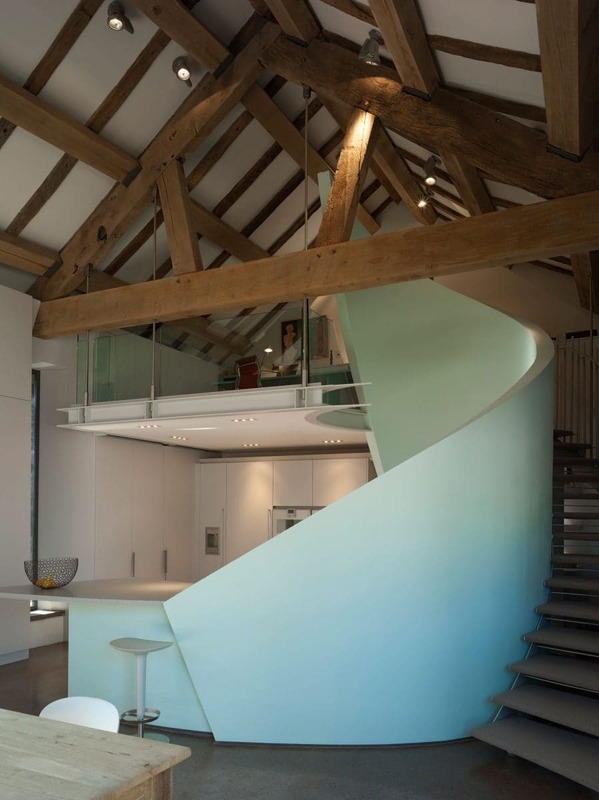 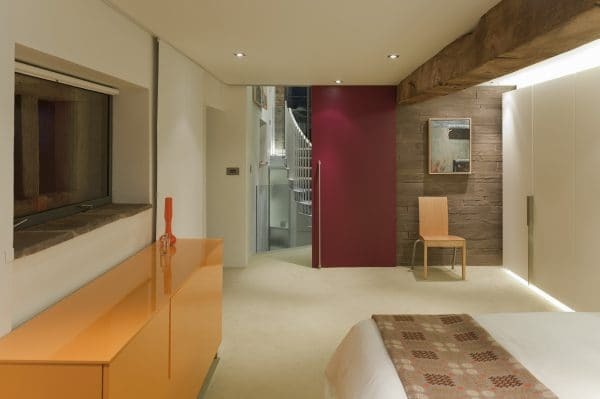 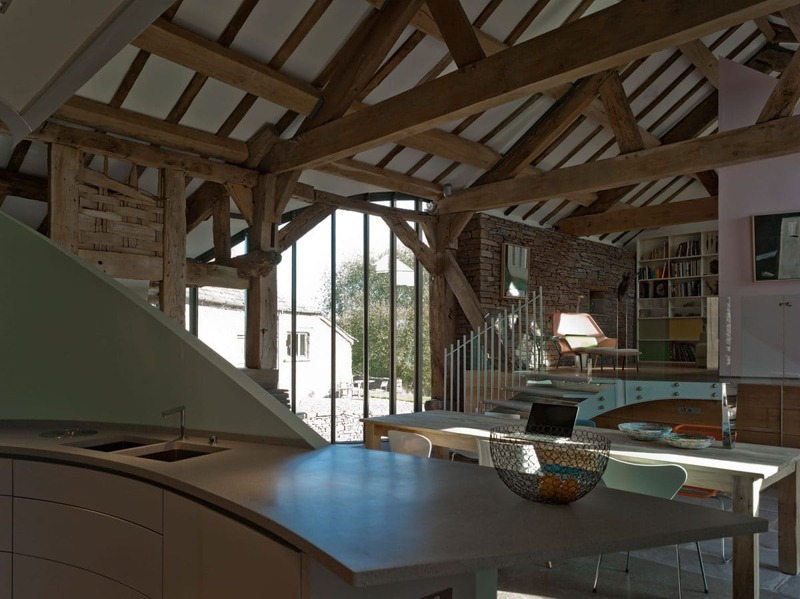 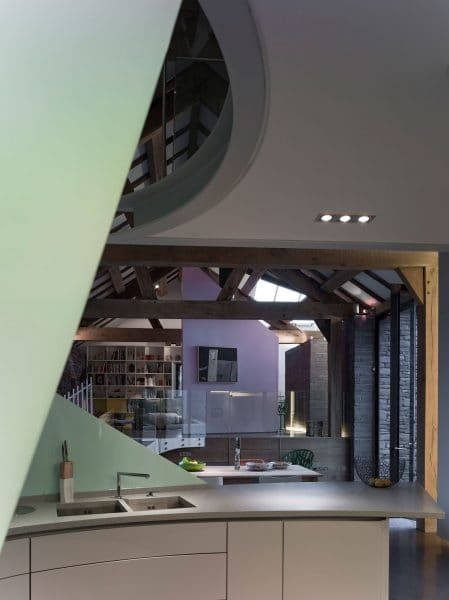 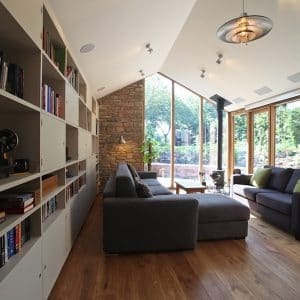 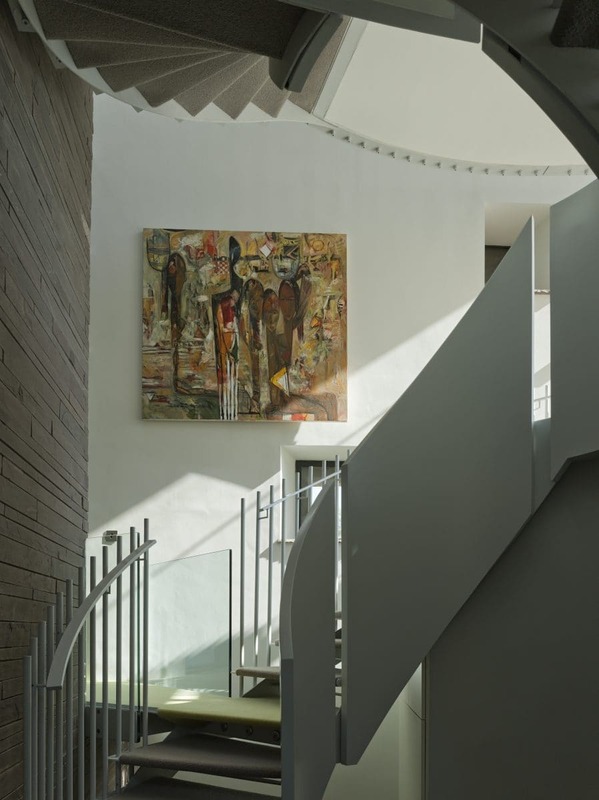 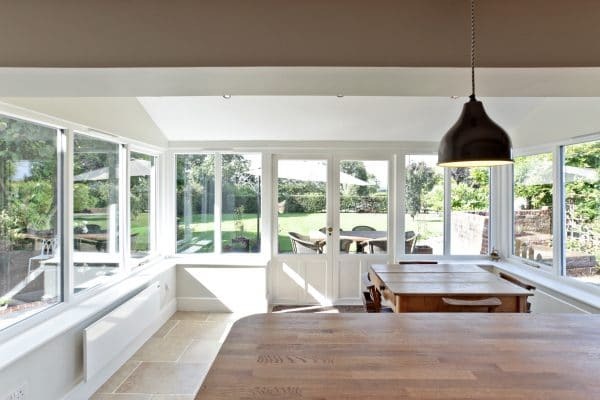 Our design-conscious clients wished to transform the barn into a contemporary open plan and sustainable home using the skills of local crafts people working with local materials. 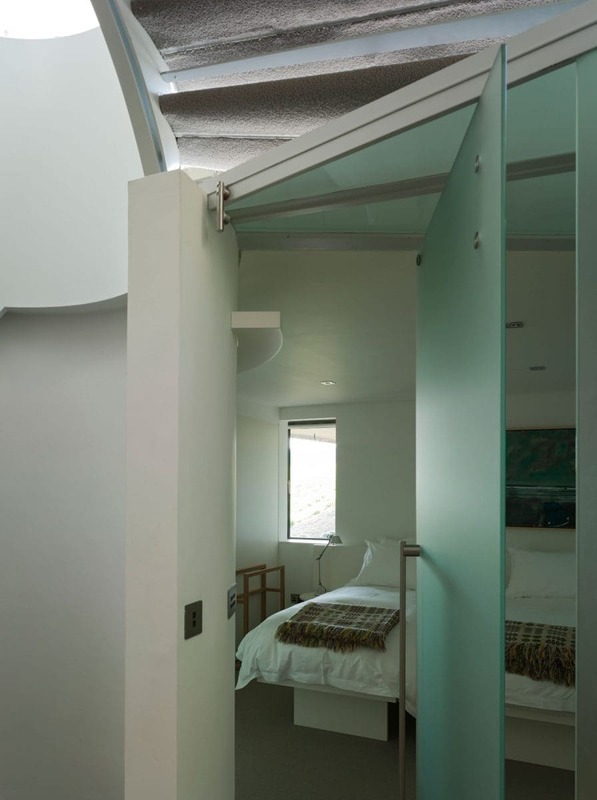 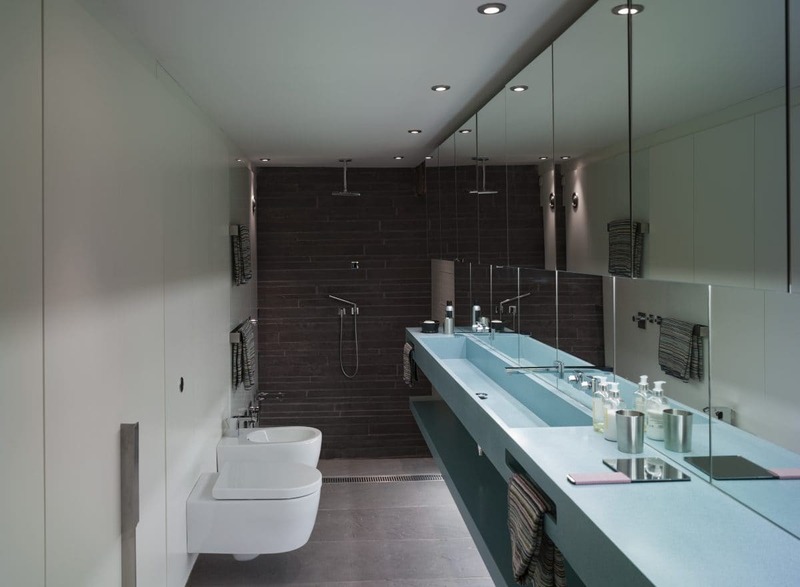 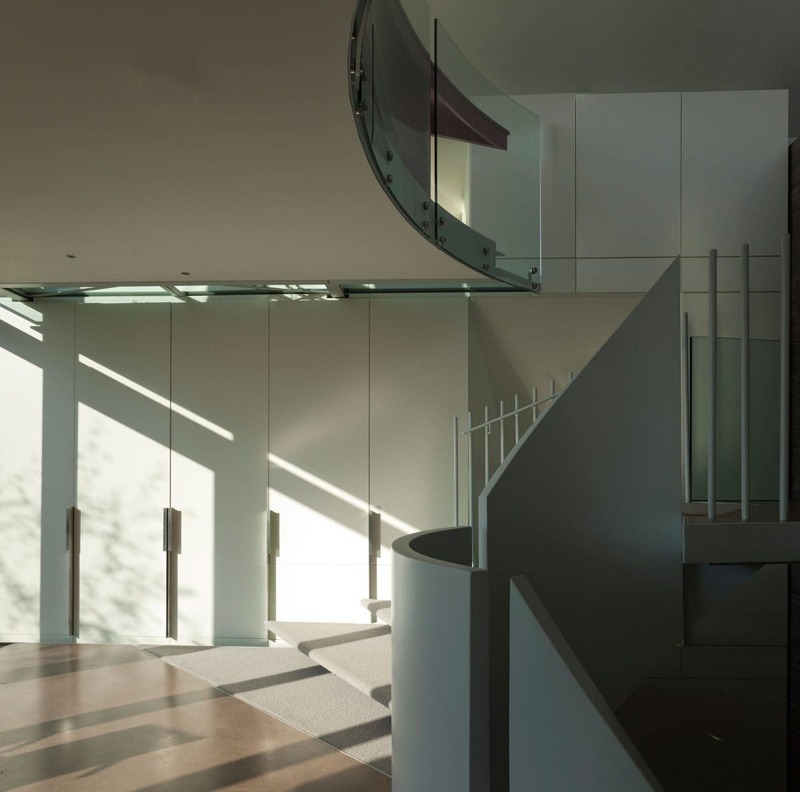 Working with our clients we took a sensitive approach that retained the integrity of the existing fabric and structure whilst accommodating new and unique spaces. 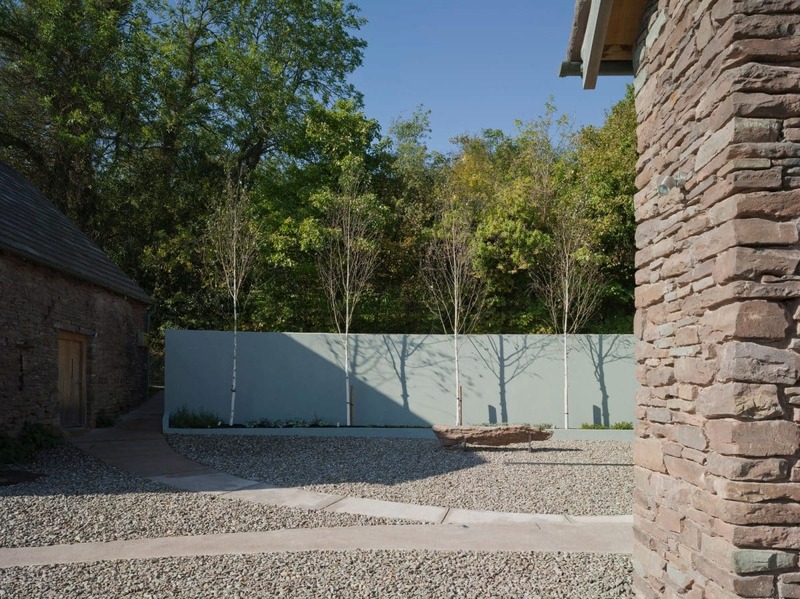 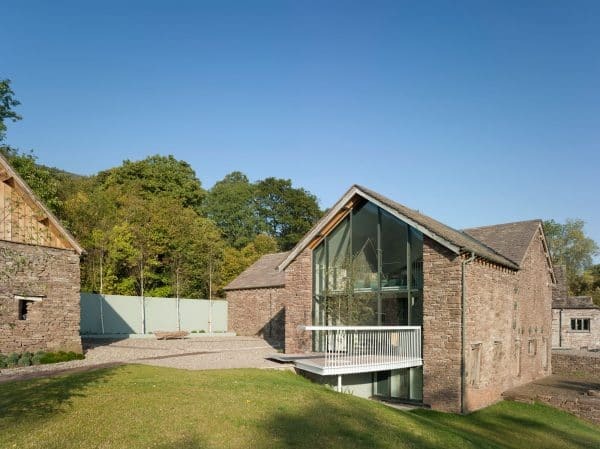 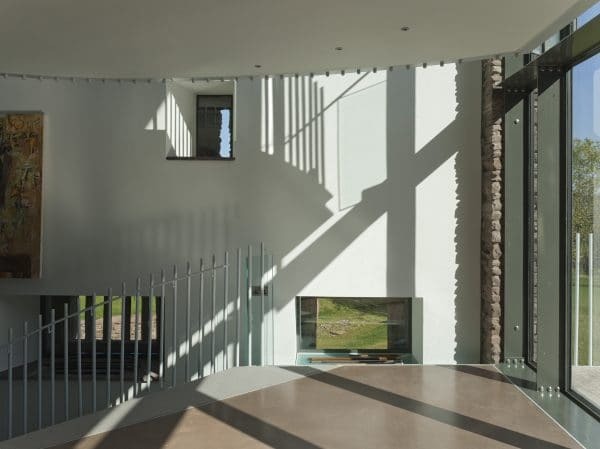 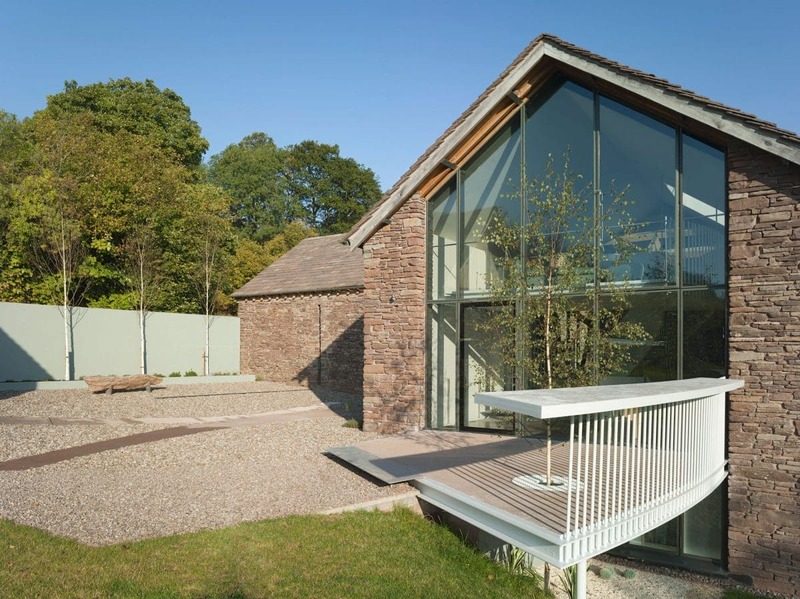 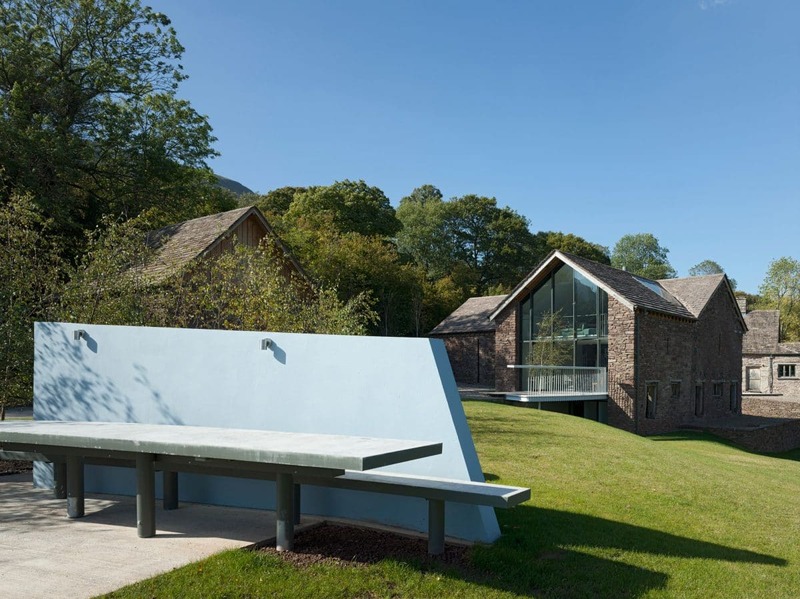 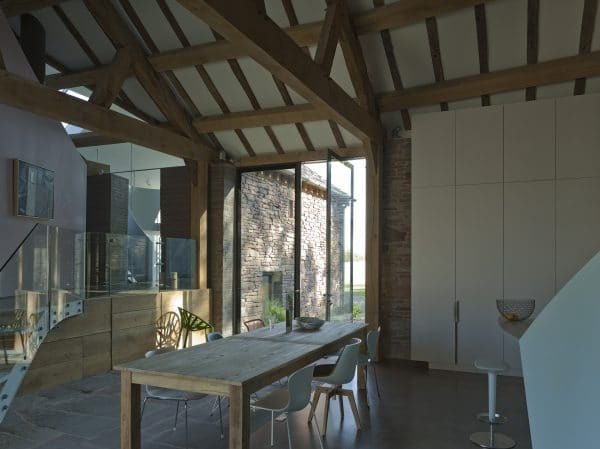 Communion was approached by design conscious clients who had purchased a derelict barn in Herefordshire. 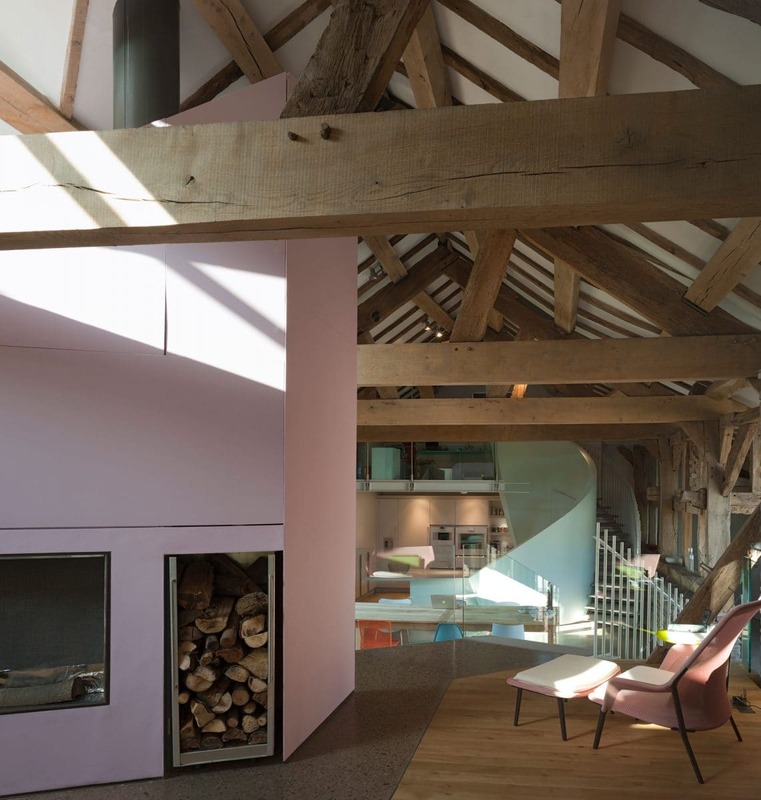 The barn was to be re-imagined as a unique open space home. All the work was delivered by local trades people and used local materials. 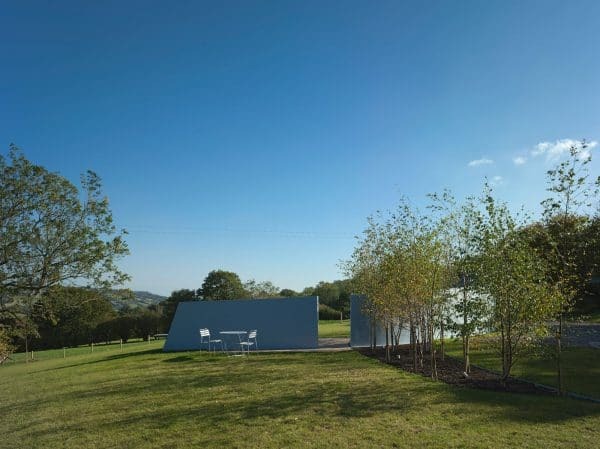 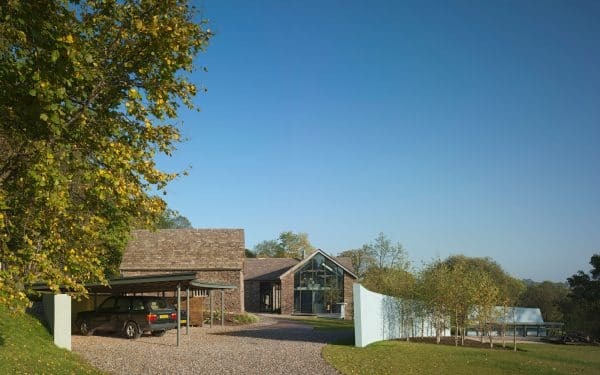 The clients, who live in London, wanted a rural retreat where they could spend time and invite friends and family. 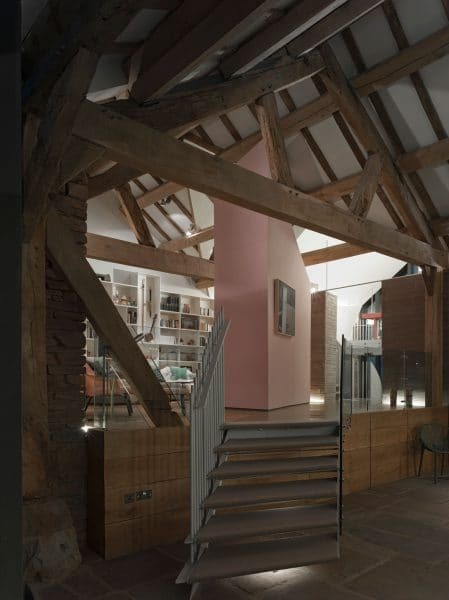 Our architecture believes you conserve the historic fabric and we went to great pains to put that back together. 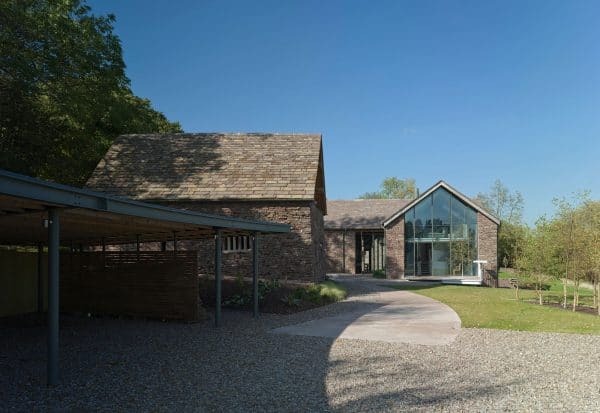 The barn, which is curtilage listed, dates from the 17th century and has inspiring views over the rolling Herefordshire countryside. 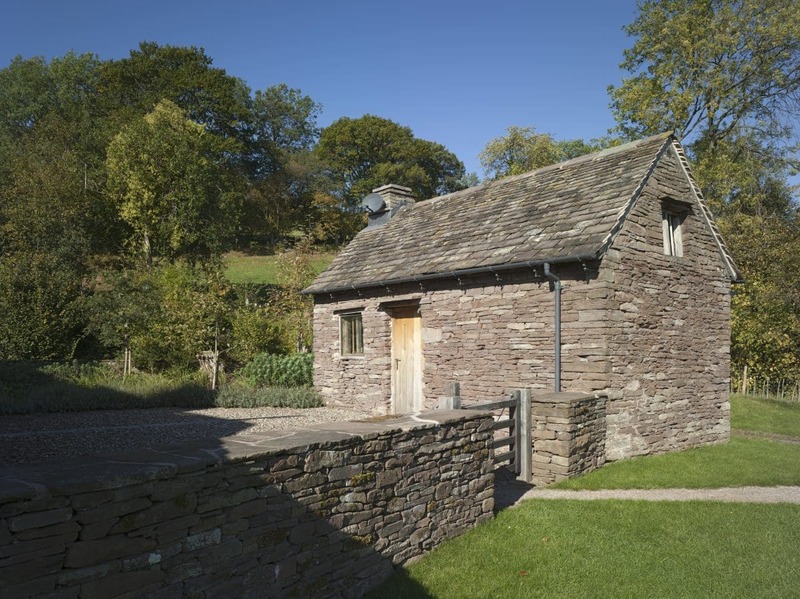 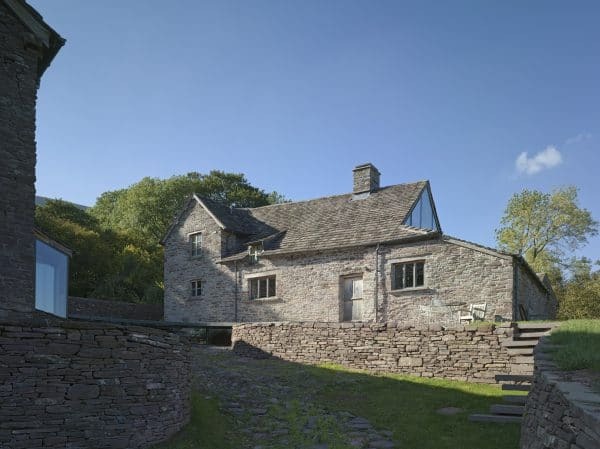 Its hillside location and lack of recent maintenance had had an almost disastrous effect on the oak trusses, stone wall and stone slate rooves. 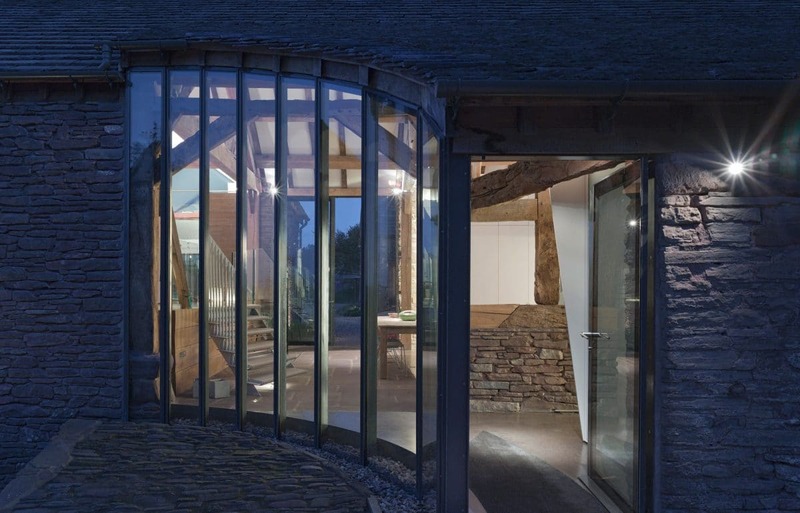 However the original quality of the construction was clear to all those who were brave enough to enter the structure. The brief from the client was to create a unique spatial experience, only using local materials and local crafts people. 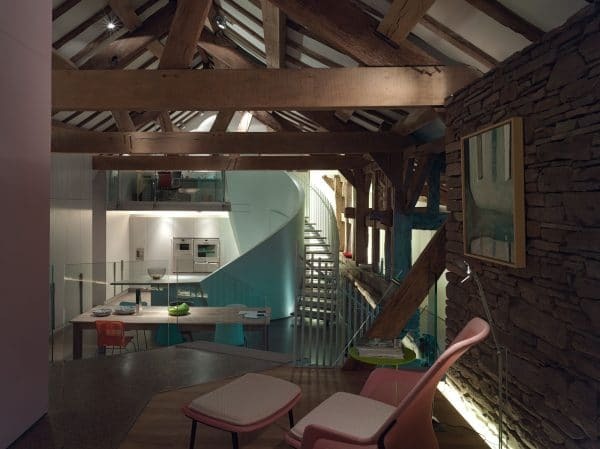 The brief requested open plan living, with two private bedrooms with en suites. 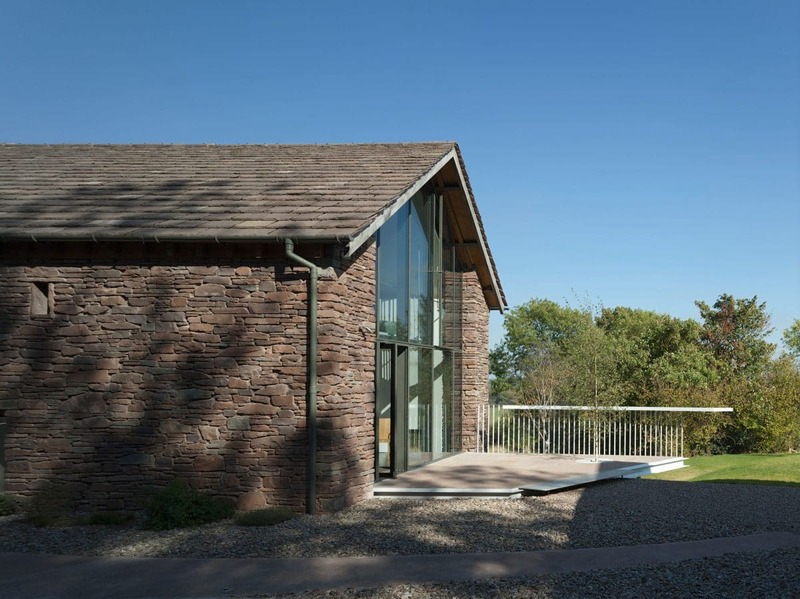 Sustainability was also key, with requirements for renewable energy and natural water disposal. 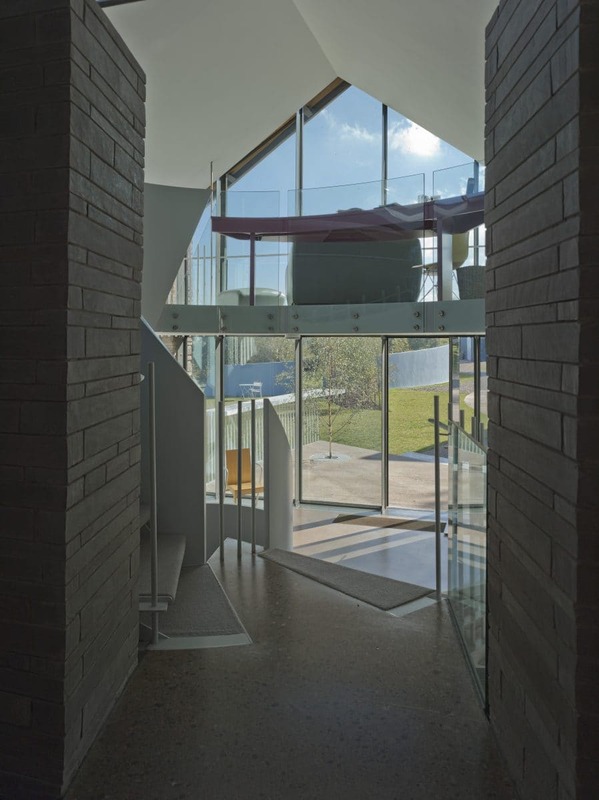 Communion’s first move was to protect the existing structure from imminent collapse. 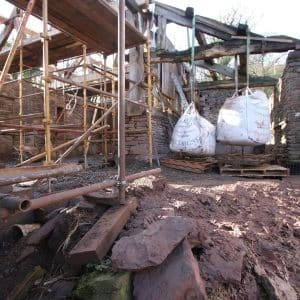 This involved shoring all the stone and timber structural elements, then carefully rescuing the valuable stone roof tiles to prevent any more being lost through falling. 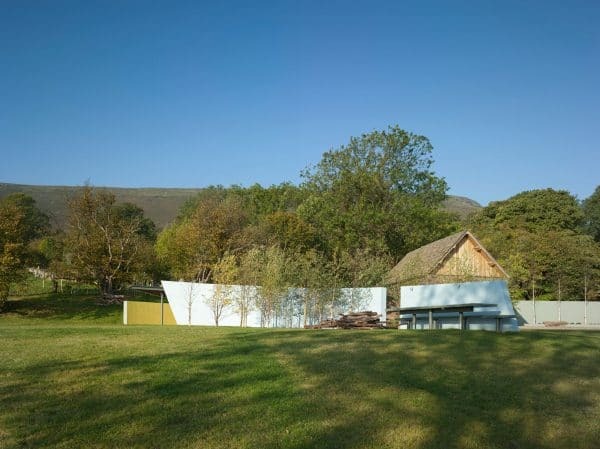 The entire structure was then protected with a temporary roof. 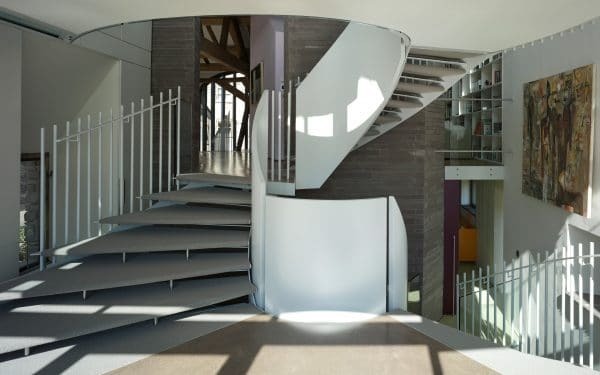 At this stage the design was developed. 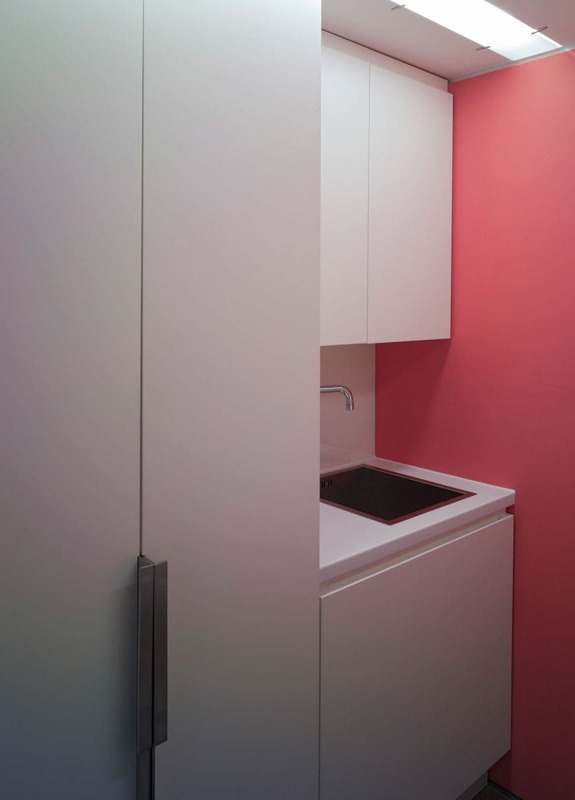 Conserve and repair all existing elements. Where the original elements were still available they were repaired using the latest conservation techniques; where original structure was completely lost, innovative structures were designed to both secure the historic fabric and enable the transformation to occur. 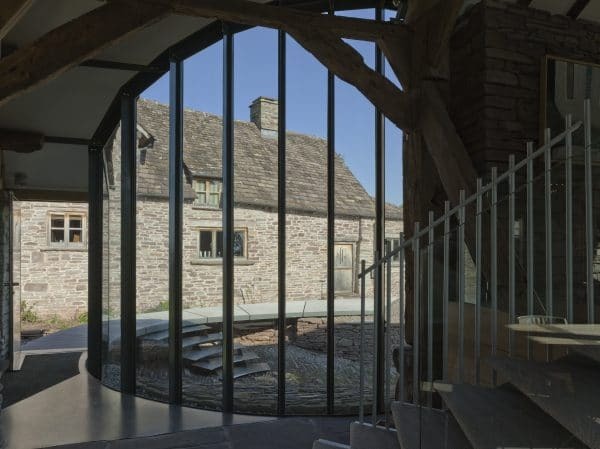 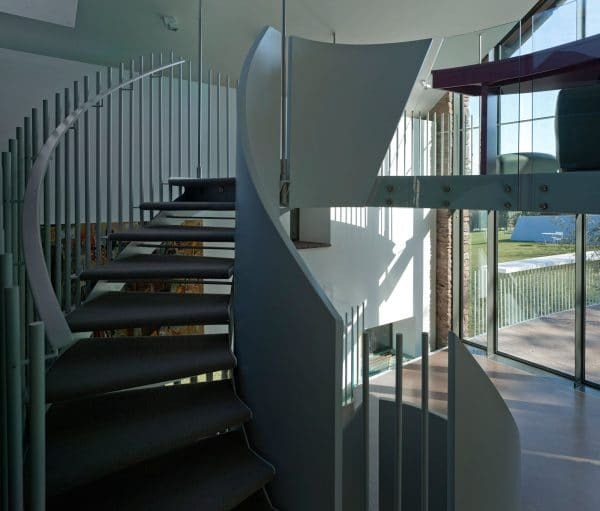 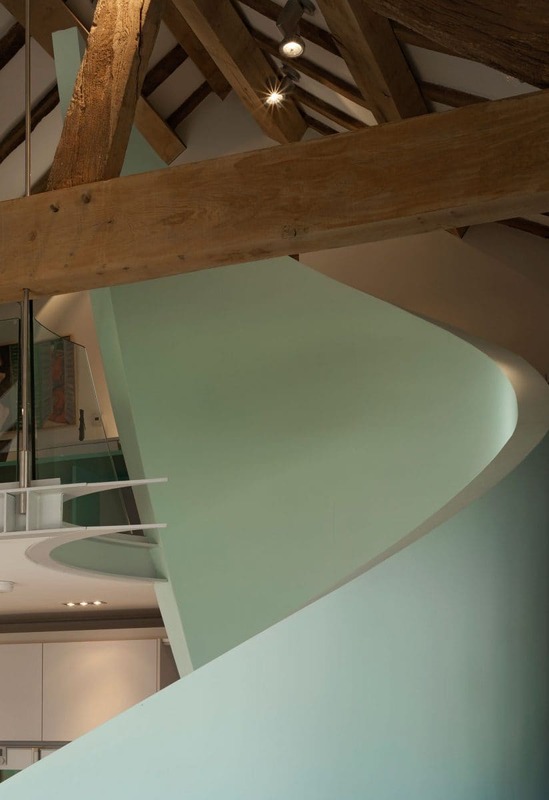 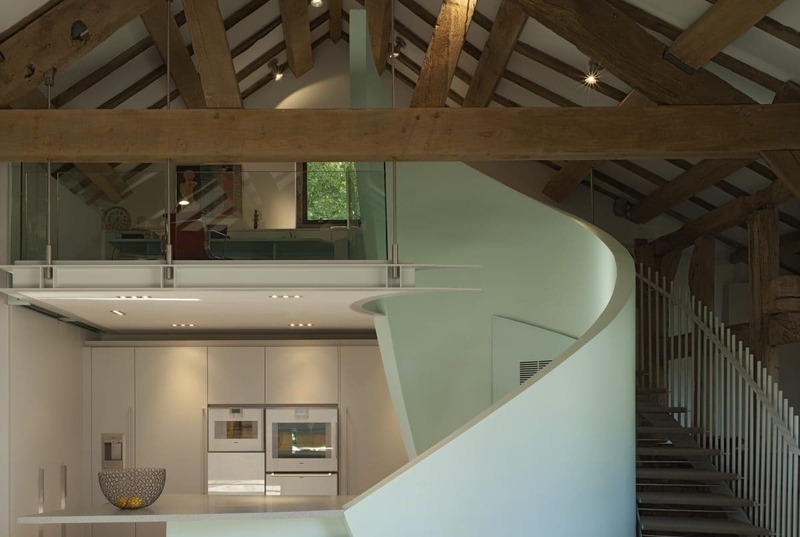 Insert finely detailed ‘screens’ to complete the building envelope, including a dramatic curved glazed screen to join two previously separated spaces of the barn. 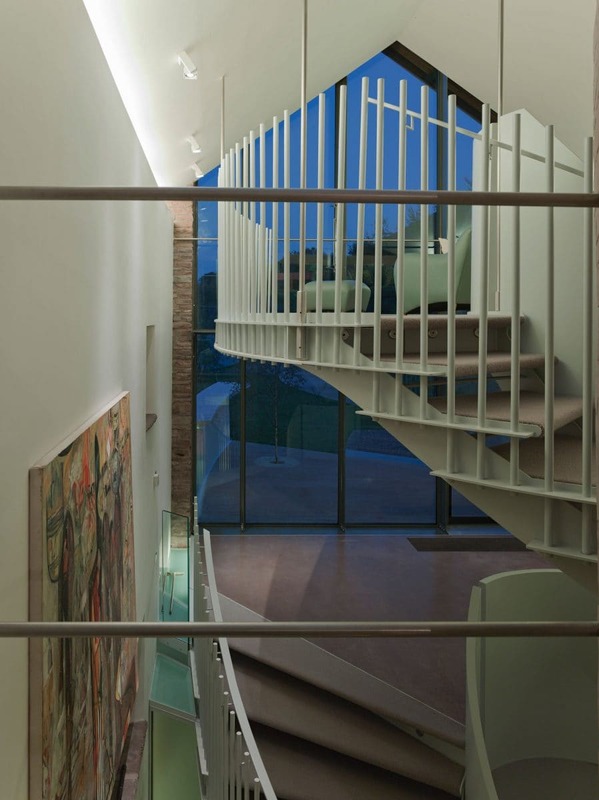 ‘Overlay’ freestanding and free hanging structures to allow the existing space to be clearly experienced, but to moderate the open plan spaces and transform the building from agricultural use to contemporary living. Provide all services to heat, light and wire the building for sound, vision and communication. 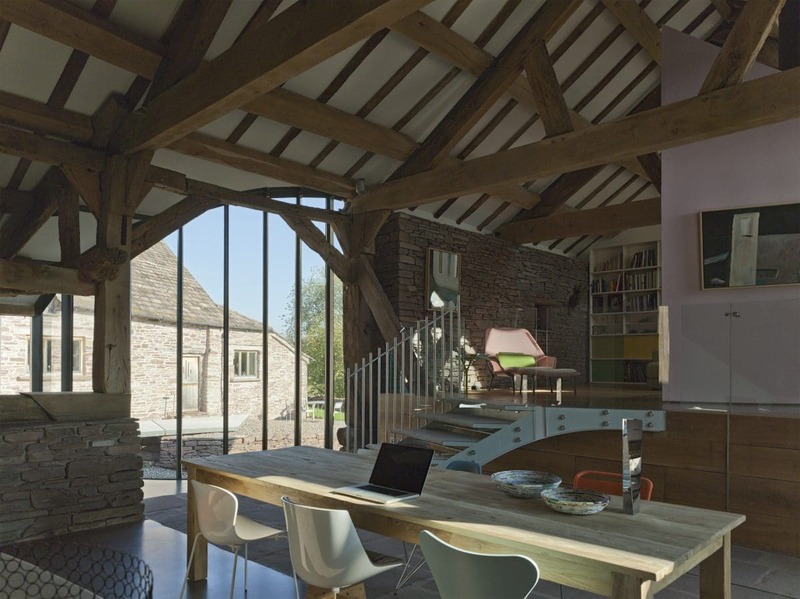 The rewiring enables the house to operate as an office so the client can work seamlessly from home. Heating was provided with underfloor heating connected to a heat pump located remotely. 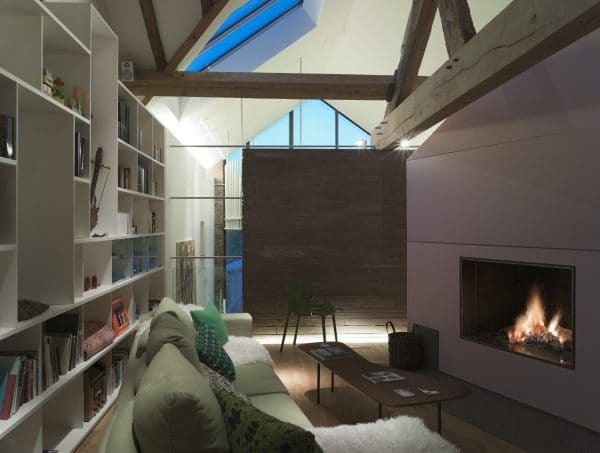 An open fire gives additional heat and the joy that only a real fire can bring. 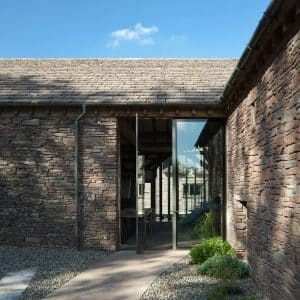 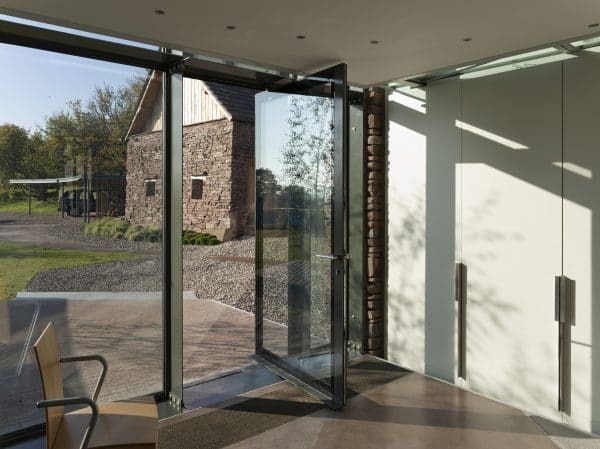 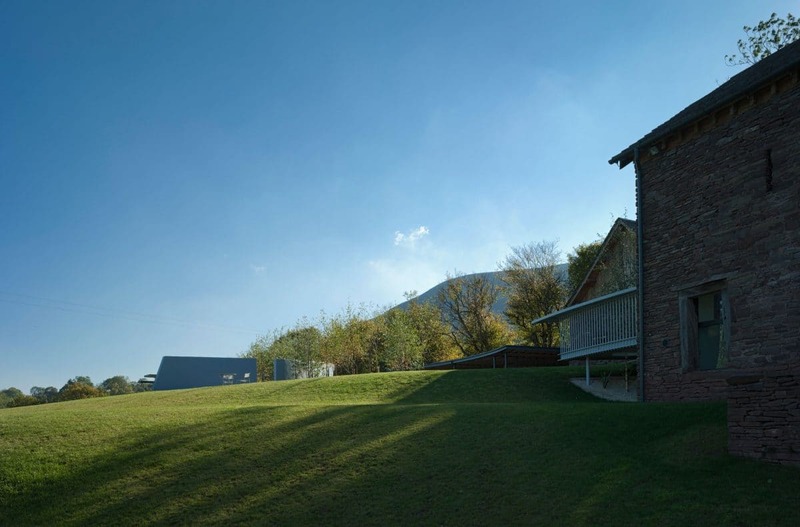 Re-connect the building back into its landscape through subtly designed access points that allow the clients to experience the farmland landscape every day. 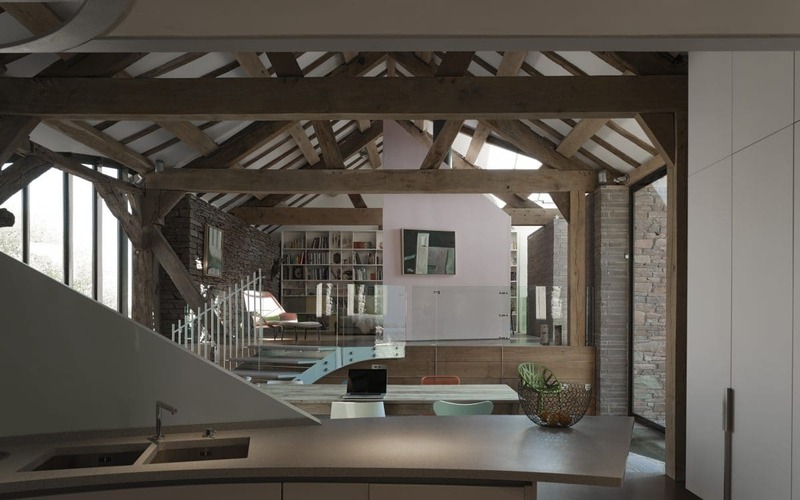 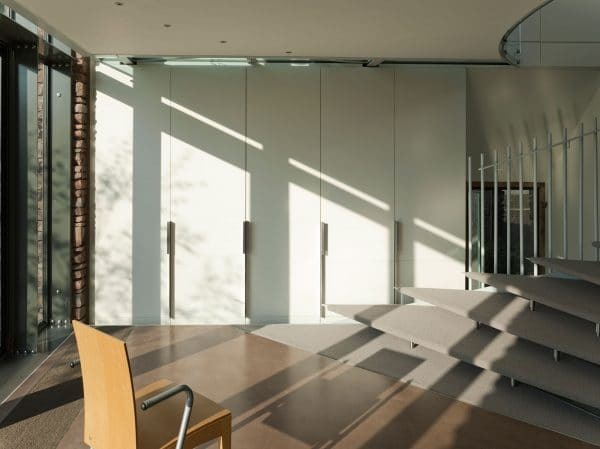 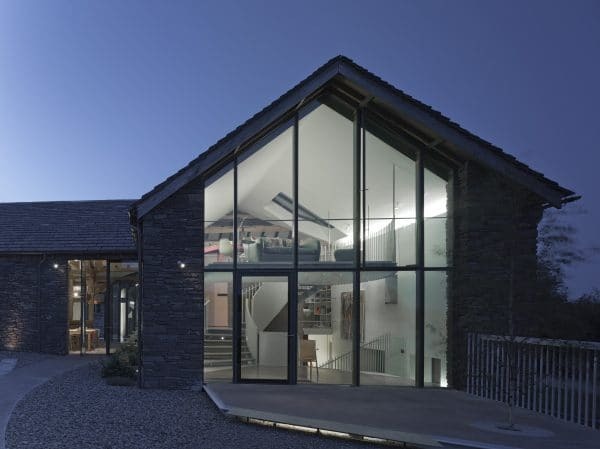 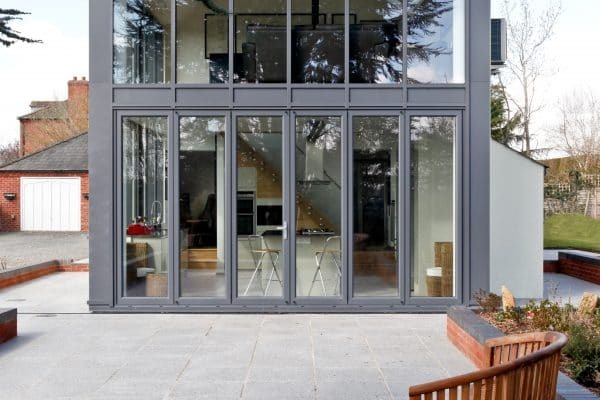 This approach was approved by the client and won planning and listed building consent as it sought to retain the integrity of the existing fabric and structure, whilst accommodating new and unique spaces. 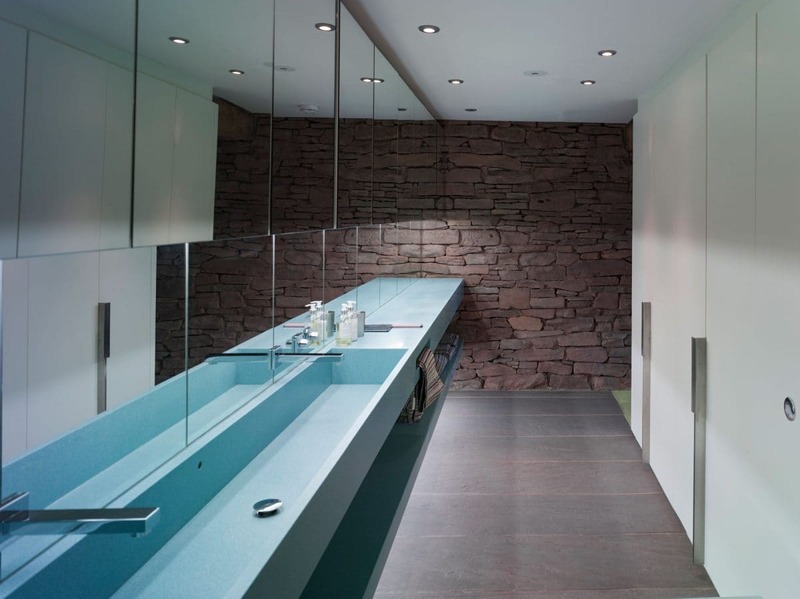 For example, the bathroom is completely made out of stone. 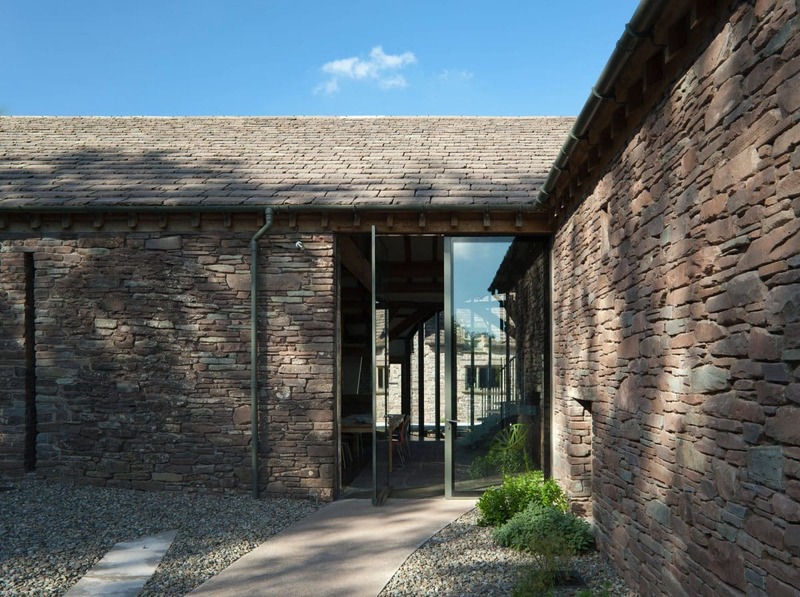 This gives you an experience of stone and water, which is what the site is all about – the farm was originally positioned here because there was a stream and therefore a source of water. 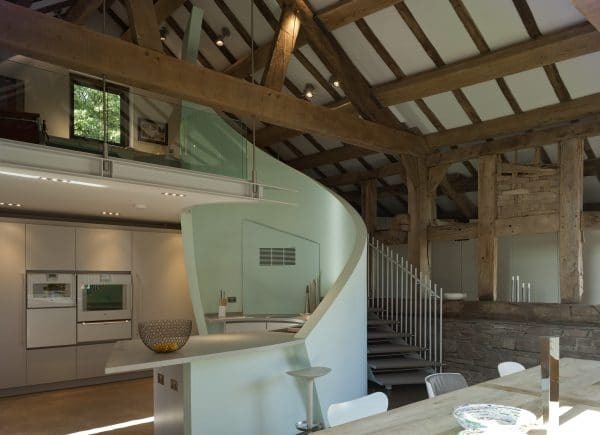 Our clients are utterly delighted with their Barnhouse.